When we’re babies, we’re much too young and innocent to realize just how great it is to be a baby. They get fed 8 times a day. They get to lie around and nap as much as they want. They don’t have to pay any bills and they have zero responsibilities. No one ever tells them to get a job. No one ever gets mad at them for having sticky hands or not having any pants on at 2:00 P.M. in the afternoon. No one thinks that they’re “gross” for wetting their pants. Then, sadly, we grow into adults. People expect you to come to work every day. You can’t take naps whenever you want and you have to drink copious amounts of coffee just to stay awake. If you throw a tantrum in public, people just think you’re being unreasonable, not matter how bad of a day you’re having. And you definitely need to wear pants, especially if it’s past 9:00 A.M. on a weekday. But what if we had another option? What if you could recapture that experience of being a baby when you’re old enough to appreciate the luxury of being a baby. 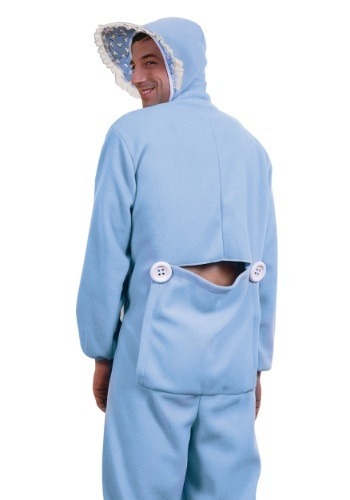 This Adult Baby Pajama costume helps you get in touch with your younger self. It's a baby blue jumpsuit with a bonnet. It has a flap in the back, for easy diaper changes should you decide to go full-on with the adult baby routine. It’s the perfect outfit to help you revert to your baby days. Of course, we don’t suggest quitting your job and resigning yourself to a life of infancy. However, a day or two acting like a baby might be exactly what you need to recharge. Just make sure you have someone in your life willing to do a diaper change or get yourself enrolled in some daycare!